Google introduced Maps Labs Friday, a cool new set of innovative add-ons to its popular map service that offers a multitude of new ways to explore places near and far. 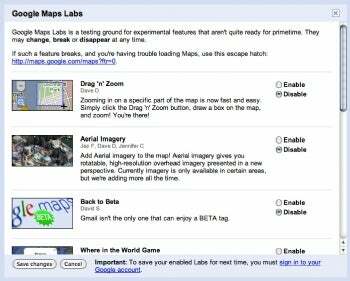 Google Maps Labs is an incubator to test features for the Google Maps service, in the same spirit as Gmail Labs. When you go to Google Maps, click on the green flask icon at the top, where eight new test features await. Among the experimental features in Google Maps Labs, you will find "Drag'n'Zoom," which will let you draw a box on the map to immediately zoom into that place and "LatLng Tooltip," a feature that shows the latitude and longitude of where the mouse pointer is positioned. "Aerial Imagery" is available only for certain areas, while the "Where in the World Game" tests your knowledge of world geography with satellite imagery. Other Maps Labs features include "What's Around Here?," which shows the top results in the current view and "Smart Zoom" will check in advance what imagery exists before you zoom in, so that you don't get the annoying "We don't have imagery at this zoom level" message. You can play around with these features and more in Google Maps Labs by clicking on the green flask button at the top of the page and then enabling each feature individually. The other nifty addition from Google this week is Chart Tools, a new developer toy for creating static and interactive charts. The free APIs let you render all sorts of charts, QR codes, and math formulas. The Vizualization API in the Google Chart Tools provides interactive charts that render into your Web browser, and can trigger events with tool-tips and animations. Google is showcasing a variety of applications for these charts, such as bio heat maps, gauge charts, geo maps, intensity maps, or motion charts.